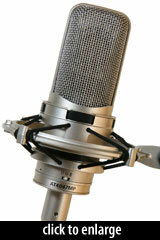 I used the Audio-Technica AT4047MP on male vocals, acoustic guitar, and drum overheads. Testing equipment included a Pro Tools HD System with 192, Sync HD, Millennia 8 HV-3R Pre and 5.1 Genelec 8040A monitoring system. I felt that the AT4047MP really shined on male vocals. It faithfully captured the full range of the human voice while being clear, present and full. I’d be very content to use these on vocals again in the future. The AT4047MP really shined on male vocals. After this, I was a little surprised by their performance on acoustic guitar. On the whole, I felt that they performed well, with a clean and clear top end, but compared to other mics in this price range, lacked some presence in the lower-mids and consequently to my ears, appeared to have less warmth than I would have expected. On drum overheads, I felt that they redeemed themselves. After playing a bit with mic position, the entire kit was picked up admirably and blended very aesthetically with the individually miked elements of the kit. One of the only “issues” I had with these mics concerned shock-mount design. I found them of decent construction, but very fiddly to insert the mics into. I was never happy with the way the rubber bands tended to fold over themselves, and it’s near impossible to get your fingers in to straighten them out. That being said, they did hold the mic securely and I never felt as if they would slip out. These are heavy mics, so I’d be a little nervous to use them in a live situation. Sandbags are absolutely necessary to prevent the stands from toppling over. To sum up, I’d say that if you’re looking for a budget, but good quality studio mic, then you can’t go too far wrong with this one. Especially because they provide some versatility with different pickup patterns. Paul was not able to share any of the audio files he tracked with the AT4047/MPs, so I’ve contributed some of my own. Note that these samples represent three different performances. Let me just say first how much I appreciate that none of these mics has a hyped, peaky high end. They all sound natural, full, and realistic, with minor differences (to my ear) in tonality. I think all three sound good. It is interesting that despite the differences in self-noise rating — 4dBA for the KSM44A, 10dBA for the LCT-640, 14dBA for the AT4047MP — there was no practical difference in the noise level of these tracks. Even when listening to the silence before a take, in the original session, I heard no meaningful difference. The drums were miked in the “recorderman” position using the preamps in my BLA-modded Digi 002R, at 24-bit/44.1kHz. As above, these clips represent 3 different performances. As Paul suggested, the AT4047MP does a nice job at capturing the sound of the kit. The AT4047MP track captures a bit more of the room than does the KSM44A, making the drums sound bigger. The more I hear from the AT4047MP, the more I appreciate it. The mic never fails to turn in an honest, unhyped track, and it sounds good everywhere I try it. It is clear the MP carries on the tradition set by its Cardioid predecessor, the AT4047/SV. 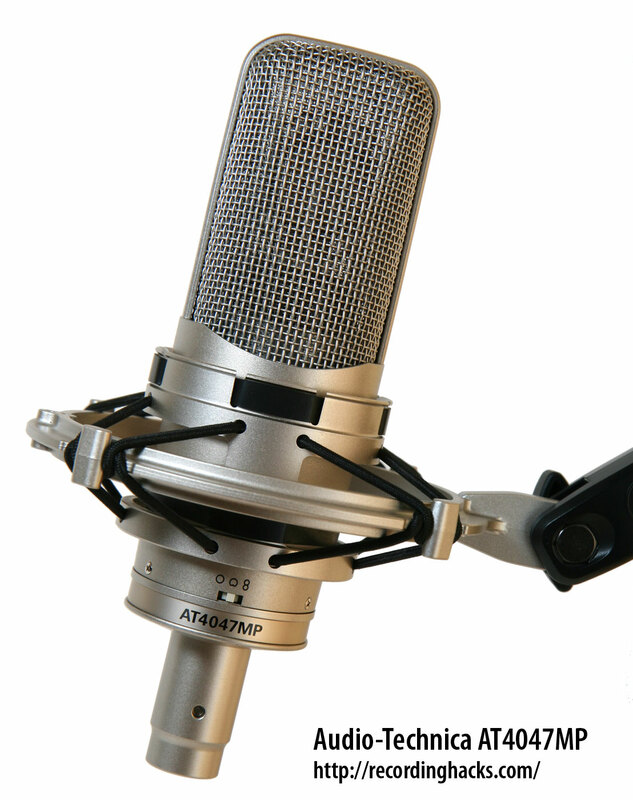 If you’re looking for an all-around studio workhorse condenser, the AT4047MP is tough to beat. Special thanks to Chris N. and Karen E. of Audio-Technica for the AT4047MP loan, and to Paul Simmans for sharing his impression of these microphones. Next: Welcome Shure Notes Readers! Hi, hard to tell the difference with my crappy speakers. I can tell a difference though. I think on my speakers I like Audio-Technica AT4047MP. I think the Shure sounds excellent in this application, just the right definition in the highs.